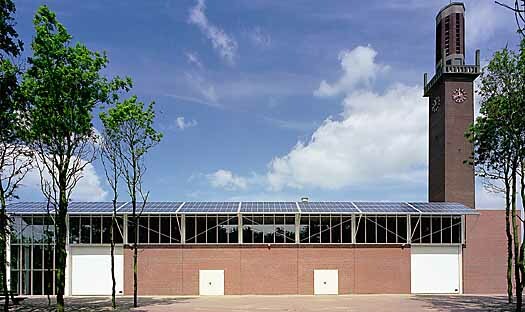 Summary The Golden Tulip Conference Hotel Leeuwenhorst in Noordwijkerhout has ordered for the integration of 180 square meters of solar panels on a new wing of the building. The panels function as sun screen. The panels are 5% transparent. The expected total yearly energy yield is 13,000 kWh. The Golden Tulip Conference Hotel Leeuwenhorst was the first businesslike customer of Energy and Water Supply Rijnland to install a solar pv system. The system is one of a few energy-saving measures of the hotel. The project shows that solar panels can have more functions. The current performance of the system is presented to the visitors of the hotel on an electronic display. The congress centre is very content about the results.